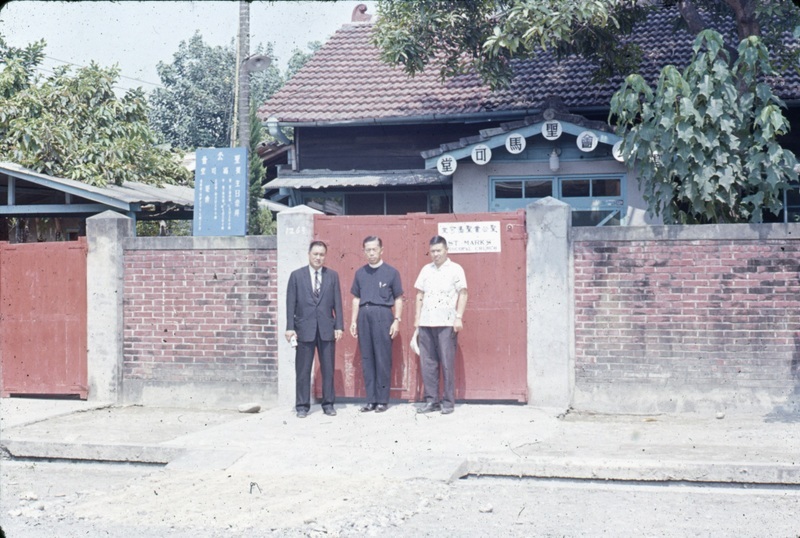 Visit to the Taiwan Episcopal Church 台灣聖公會 of Bishop John A. Pinckney from Taiwan’s Companion Diocese, the Episcopal Diocese of Upper S. Carolina (EDUSC), October 1965. St. Mark’s Church, Pingtung 屏東市聖馬可堂 was described in the EDUSC report: “The church in Pingtung is a rented wooden structure which is riddled with termites. A grant is needed to purchase land and build a church.” Trinity Church, Columbia raised US$ 30,000 for this purpose. In the centre is Rev. Herbert C.M. Yen 嚴欽明牧師, on his left is then Archdeacon James T. M. Pong 龐德明 , visiting from Hong Kong; he would go onto become Bishop of Taiwan 1971-79.